Previous posts on this blog have reported on the fall in total government employment (federal, state, and local) during Obama’s presidential term, in stark contrast to the increases seen during the term of George W. Bush as well as during the terms of other recent presidents. The same pattern, of government jobs falling under Obama and rising under other presidents, is seen when one takes as the starting point the beginning of an economic downturn rather than the date of inauguration. Government jobs have been cut compared to what they were at the start of the most recent downturn, in contrast to the increases approved in previous downturns. These cuts in government jobs during Obama’s tenure, as well as the cuts in government spending, are of course exactly the opposite of what one should do during an economic downturn. An earlier post estimated that if government spending been allowed to grow at the pace it had under Reagan, the economy would likely have reached full employment output already in 2011. In terms of overall fiscal impact on the economy, a focus on total government employment and spending makes sense. The total impact depends on what is being done at all levels of government – federal, state, and local. But a president has only limited influence on what is happening at the state and local government levels. It is federal government employment and spending that a president, together with the congress, determine. Hence in terms of assessing the direction of policy during different presidential terms, limiting the analysis to the federal level makes sense. The question to be addressed is whether, as many conservatives charge, the number of federal employees has grown sharply under Obama. The chart at the top of this post shows federal government employment as a share of the US population going back to January 1953, the month Eisenhower was inaugurated. The government employment figures come from the Bureau of Labor Statistics. Note that federal government employment excludes active duty military personnel (but includes civilian employees of the Department of Defense). The population numbers come from the Census Bureau (most conveniently accessed via FRED). But since the mid-1960s (with the major exception of most of the Reagan term), federal government employment has been on a downward trend, most sharply during the presidential terms of Clinton and now Obama. The recent fall during Obama’s term might be less of a concern if it was a reversal from a recent sharp increase, or as a reversal of an upward trend. But government employment is already a third below (as a share of population) where it was through the 1980s, and is being cut further. A fall by a third is huge. As has been noted before, federal government employment rose sharply during Reagan’s presidential term. It then fell during the term of Bush I, although not by enough to offset the increase under Reagan (when Bush was the Vice President). There was then a sharp fall under Clinton, which was reversed to an increase under Bush II. But federal government employment is now falling again under Obama. Reagan and Bush II have been celebrated by Republicans as small government conservatives. 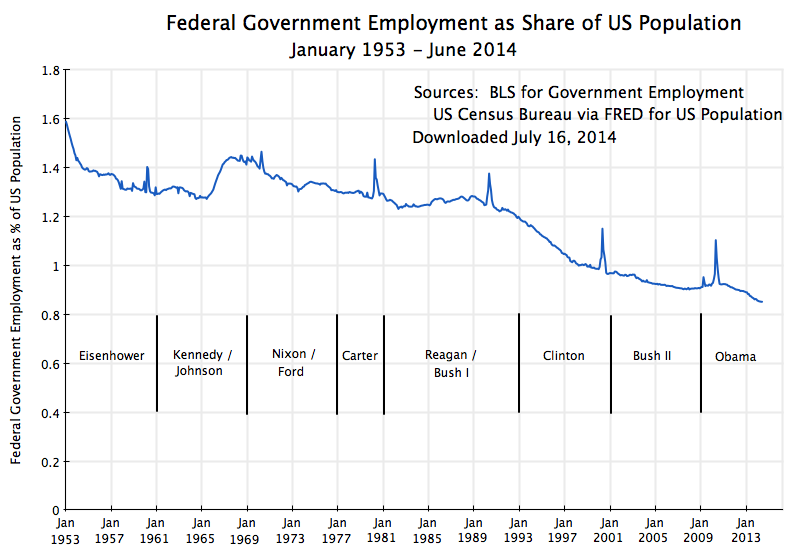 But federal government employment rose during their terms. Clinton and Obama have been denounced by conservatives as big government liberals. But federal employment fell sharply during their presidencies. And federal employment also fell during the term of Bush I, the most moderate of recent Republican presidents. The facts are simply not consistent with the stories told of these presidents. Federal government employment is thus now at a historic low (as a share of population) over a period of at least six decades. It should not then be a surprise that government programs may be inadequately administered. One often simply needs more personnel to do it. A clear recent example of this is the crisis in the Veterans Administration. The number of veterans has increased sharply in recent years due to the legacy of the Iraq and Afghanistan wars, and veterans from the Vietnam War are now of the age when they most need health care. A significant number of aged World War II and Korean War veterans also remain and need care. But the number of doctors, nurses, and other staff at the VA hospitals have been held back from the number needed to provide good care. And it cannot be said that the existing staff are lazy. The doctors are fully booked. Rather than face up to this, lower level staff have for many years now been falsifying records to make it appear that veterans can see a doctor within a reasonable time, when that is not the case. This of course has made the problem worse, as no one then faced up to the problem and did something about it. Senior officials in the VA have stated that they were unaware of what was going on. Having worked in a large bureaucracy myself for most of my career (the World Bank), I can readily believe this to be true. Senior officials are often unaware of what is common knowledge among front-line staff. But covering it up by falsifying records only served to make the problem worse. A bipartisan deal appears to be close to congressional approval to provide additional funding to the Veterans Administration, to go at least some way to resolving the problem. An additional $5 billion in funds will be provided to hire more doctors, nurses, and other staff needed to provide the care veterans have a right to, while $10 billion will be provided to allow veterans to go to more expensive private health care providers in those cases where they cannot receive a VA doctor’s appointment within 30 days, or when they live more than 40 miles from a VA hospital or clinic. Whether this funding will suffice is not clear, and has been questioned. Earlier estimates on the funding needed were far higher. But Republicans in Congress have refused to approve more, and as of this writing, a final vote on the proposed measure still awaits. However, any extra funding will at least help. The veterans issue illustrates well the fundamental problem. While it is certainly true in any large organization, private or public, that employees exist who are not providing effective service, there are in practice limits to how much one can cut before service suffers. This entry was posted in Fiscal Issues, Labor and tagged austerity, government employment, government spending, Obama by aneconomicsense. Bookmark the permalink.